"Will God forgive me if I have an abortion?" It's a question many women have. I didn't realize how common a question it is until I wrote about this subject last time. 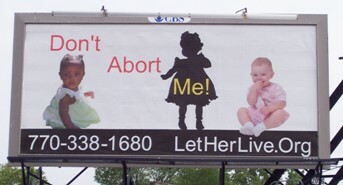 Perhaps you are thinking about an abortion or already had one and are wondering about this. If so, please keep reading, and I think you'll find your answer. If you are asking this question, you already know that God views abortion as a sin--as murder in fact. So the question is, what is God's criteria for forgiveness of a sin? Or more simply: What do I need to do to be forgiven? In a word, Repent. To repent is to change your mind about your actions so completely that you change your actions. Part of that is being sorry for what you've done. Not just sorry for the circumstances that you feel forced you into doing it, but sorry that you did it, regardless of the circumstances. Some people will think about a sin (abortion or something else), decide that they will repent the next day, and go ahead and do it. Perhaps the next day they tell God, "I shouldn't have done that. Please forgive me." And they think every time they want to commit that sin they can do it, and then just smooth things over with God. That isn't repentance. And God does not forgive someone who hasn't truly repented. So if you are thinking about having an abortion, you will either come to deeply regret it, or you will never be forgiven. That mixture of relief and guilt you may feel is not repentance. You have not repented until you come to the place where, if you were in the same situation, you would not commit the sin that you did. If you already had an abortion and you are sorry that you ever did it, and you wish you could undo it, and you have committed that you will never do it again--in other words, if you have repented of the sin--you are ready to find God's forgiveness and healing. But when you come to God for forgiveness, you can't come to have one sin removed and hold on to the rest. With God it is all or nothing. You only come to God through Jesus. He paid for your sins when He died on the cross for you. To receive the forgiveness He died to provide, you must trust in Jesus. That means you depend on what He did to pay for your sins. It also means you believe what He said about being God--you trust Him enough to obey Him. You don't come to the bargaining table with God. You have to surrender everything. Imagine God as a king with subjects. Someone has led an insurrection against him, and he is going to punish the rebels. If a rebel comes to him and says, "I'm sorry about one crime I committed, but I'm not sorry about all of the rest," the king won't have much mercy on him. But perhaps the rebel comes to him and says, "I'm ashamed of everything I did. I can't make it up to you. I have nothing to give you to repay the damages. But I submit to you now, and I'll do anything you tell me now." Then the king forgives him, and adopts him as his own child, and gives him an inheritance in his kingdom. God wants complete repentance and a complete submission to Him. In return, He forgives completely. He never brings your rebellion up to you again. He chooses to forget it, and treats you as if you had never rebelled. He gives you peace instead of guilt. He heals your broken heart. He assures you of His love for you. He gives you help to do what you ought to do when you feel like giving up. He promises that He will never leave you. He adopts you as His child and gives you a supportive family of His other children. He guarantees that no power or circumstance, including death itself, can ever rob you of your relationship as His child. Some people try to prove their repentance by punishing themselves. They think that if they cause enough pain to themselves, God will be more likely to forgive them. They may cut themselves or develop an eating disorder. That's trying to pay for our own sin and satisfy God on our terms. Rather than submitting to God and accepting His free forgiveness, that's telling God you don't need Him. It's a sign of continued rebellion. Whatever your situation, depend on what that Jesus did for you, submit to God and obey Him. Enjoy His forgiveness, and allow Him to heal you. You have helped me so much after reading that. I regret ever getting an abortion an I thought God would never forgive me for it but now I know what I must do and I am willing to do whatever it takes to show God that I am truly sorry. Thank you so much. I'm so glad it was a help to you. I would suggest participating in a post-abortion Bible study when you are able to. If you let me know what area you live in, I could try to help you find one close to you.